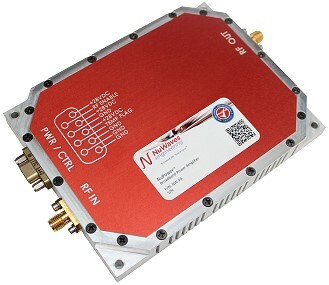 Middletown, Ohio, August 1st, 2017 – NuWaves Engineering, an international Radio Frequency (RF) and Microwave solutions provider, has released the latest in the NuPowerTM small, lightweight and high-efficiency power amplifier (PA) family of products – the 100 Watt NuPowerTM LS100A01 L & S-band PA. This PA will run at $3,775 per unit in quantities of one hundred and will be available mid-September. The NuPowerTM LS100A01 provides saturated RF power of 100 Watts typical in L & S-band (frequency coverage from 1.6 GHz to 2.5 GHz), with module efficiencies of up to 45%. With a nominal input drive level of 0 dBm, the NuPowerTM LS100A01 offers an impressive 50 dB of RF gain, while weighing only 22.6 ounces. Further, the PA's aluminum chassis features improved heat dissipation characteristics for higher-temperature operation and, at a compact size of 6.5" x 4.5" x 1.0", it is small enough for integration into a wide variety of air- or ground-based tactical, test, or training platforms. With an impressive size, weight, power, and cost (SWaP-C) profile, the NuPowerTM LS100A01 provides significant range extension for communications systems, datalinks, and telemetry systems. The PA also provides added power for electronic warfare systems such as airborne electronic attack (AEA) at low, medium, or high altitudes, and its low SWAP profile makes it ideal for medium-sized unmanned aircraft systems (UAS). "For the systems integrator that requires greater communications range, the NuPowerTM LS100A01 will provide a significant improvement with its 100 Watts of output power." said Jeff Wells, President and CEO of NuWaves Engineering. "NuWaves Engineering takes pride in offering first-rate communications solutions to the Warfighter. Our high-power amplifiers enable greater standoff distances for UAS and unmanned ground vehicle (UGV) applications, giving our armed forces the advantage in hostile environments."